I’m going to share a really “impress your friends” coffee recipe with you that should make your friends go “Wow ! you’re really good at this (insert your name here)”. OK ! first up, I’ve got to break it down to you… for purists, there’s a difference between LATTE ART and what some call LATTE ETCHING. Latte Art really means pouring your well frothed milk into your well extracted espresso and pouring it in a way that displays a design like a heart, flower or rosetta – you’ve seen many of these designs already on this blog – if you haven’t, scroll down, or check my “Art of Coffee” category or Flickr account. OK ! So what is etching then ? 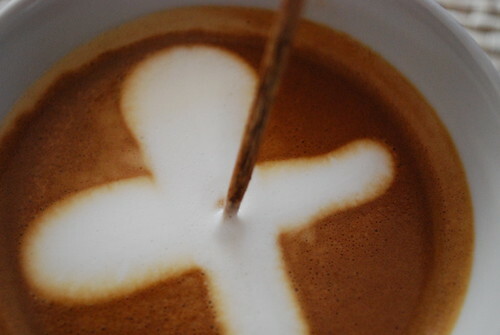 In summary, it means playing with the frothed milk by making designs with a tooth pick or tool. So to work then. Assumptions, assumptions – I’m assuming that you know how to extract a good double espresso into a cappuccino cup and that you know how to froth milk properly – note on that, if you froth milk properly, it should be fairly quiet, so if you hear that loud frothing noise in a cafe, then prepare yourself for badly frothed milk with lots of air. 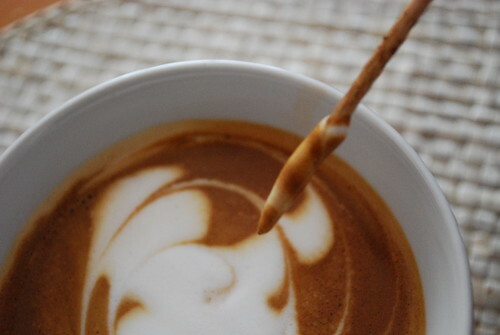 So first up, after extracting espresso and well frothed milk, pour the milk into the espresso beneath the crema cloud, making sure that there is no sign of milk, saving the real frothy stuff. 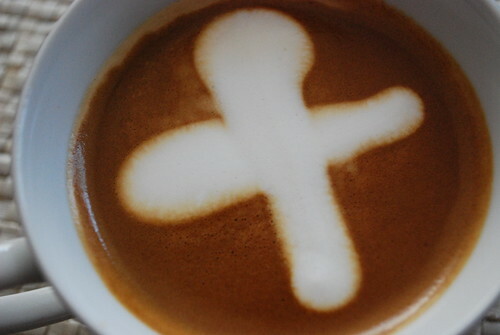 Now, spoon out the froth on top of the espresso cross ways. Now, I’m assuming you know how to draw, so quickly draw a circle outwards until you get to the edge of the cup and voila. You can even see on the stick the two tone colours, white and cappuccino brown. Good luck and I hope to get a video of this up soon on my Vimeo account, God willing. Check this space. 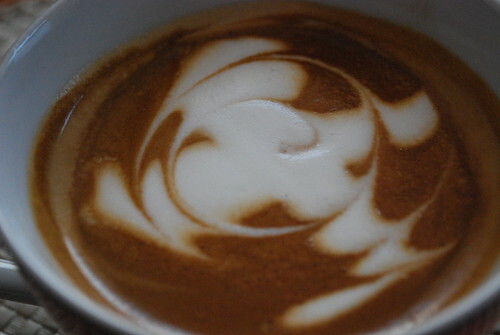 This entry was posted on Tuesday, June 16th, 2009 at 10:56 pm	and tagged with arabica, Beans, coffee, etching, latte art and posted in Coffee Recipes, The Art of Coffee. You can follow any responses to this entry through the RSS 2.0 feed.